The Bruising Adventures of Girl Clumsy: Photo time! Blogger is now letting me upload images when I post. After all that energy I spent working out how to download and use the Picasa software they previously had for putting up photos. 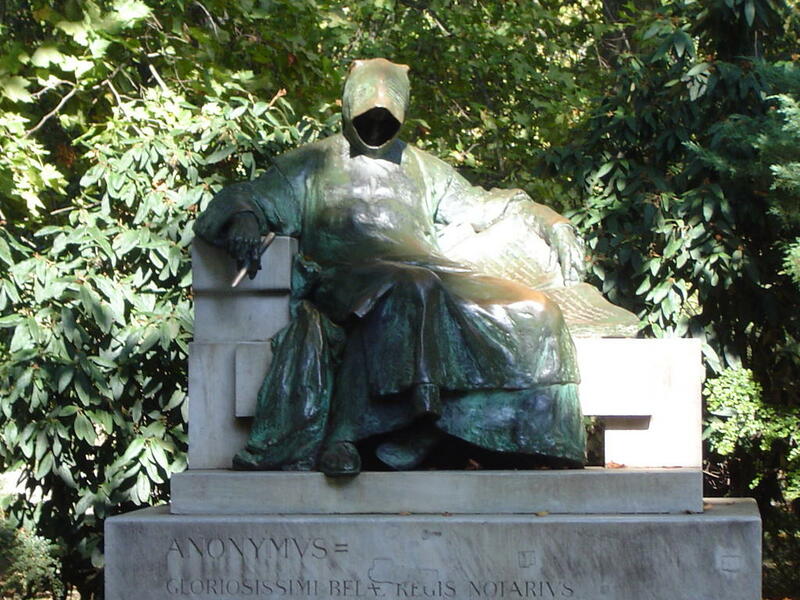 Anyway, this a photo of the Anonymous Scribe. It's in Budapest. I can't remember the name of its location - but it's like a mini-castle, with each building featuring an architectural design from the last few thousand years - Roman, Gothic etc. From memory, it was built to mark the turn of the century in 1900. Anyway, the point is, visitors are supposed to rub his pen. I can't remember why. Luck perhaps? Whatever it is, it's a cool statue. ;) Cheers, Nat. Is that a real statue? It looks like Jar-Jar Binks.